Chris’ auntie, who lives in Whangarei, spotted this in the Whangarei Report (the area’s local newspaper). That’s yours truly, during last weekend’s half-marathon. I’m not one to care about what I look like while running (proof of that was the fact that I got given a chocolate at about the 18km mark and still had chocolate all over my lips after crossing the finish line – so classy! ), but this is really making me have second thoughts about the hydration pack. Is there a dorkier-looking running accessory? I don’t think so. Well. I may be a dork but I’m also a “prepared runner”. 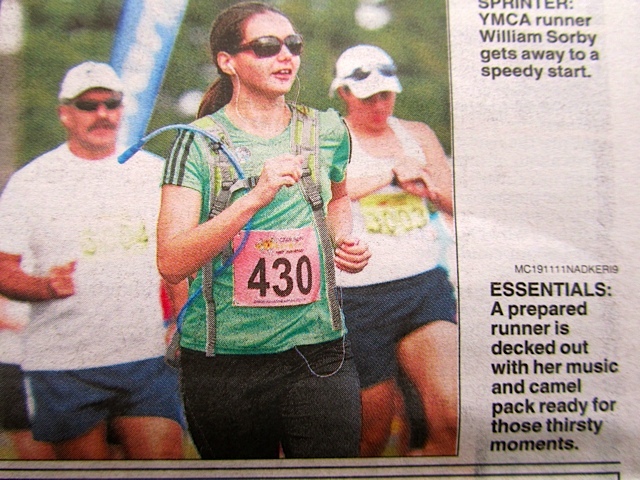 What the caption writer doesn’t know is that the stupid hydration pack let me down a few times during the run by clogging up and not giving me water. Prepared, schmepared. Categories: running | Tags: half marathon, kerikeri, new zealand, running, whangarei | Permalink. Pahaha you are hilarious. 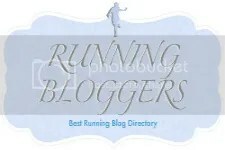 Yeah i agree you look great – to us fellow runners anyway! The hydration pack is so freakin’ awesome, doesn’t the water bounce around though? I used to always wear one when I did mountain unicycling trails (yeah, true story) but I can’t imagine running with it. I would like to think I look that good when I’m all sweaty and running!